Let the Wind carry you up into the sky, tossing you about with the force of the elements! 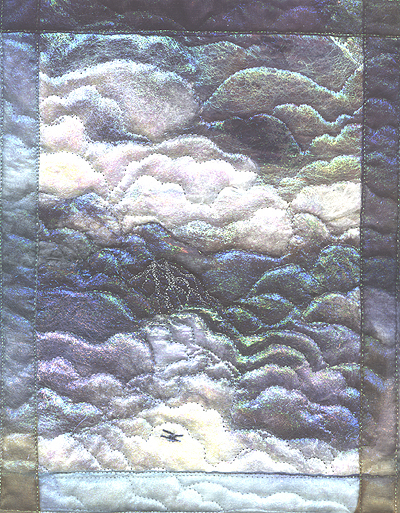 These clouds are made of batting under various sheer fabrics, on top of a painted background. The batting is colored with pastel chalks, then layered under various sorts of tulle, opalescent organdie, sparkle organza, and other cool stuff. A pattern, fabric to paint, fabric paints, Totally Stable, Angelina fiber, chalk pastels, Tintzl, and some sheer fabrics as needed. Materials fee: $15, payable to me at the start of class. Note to Workshop Chair: Each student will need about 1/2 a table, access to electricity, and we will need about 5 irons/ironing surfaces for the class. Two extra tables will also be needed to paint on, and some plastic tarps to cover the table and/or rug would be great. thread, needles, sewing machine, seam ripper, scissors, rotary cutting tools, iron and all of the other stuff you always need. Some regular batting, silk batting, dryer lint or cotton balls – whatever you have that you can stretch into a cloud-like puffy substance. 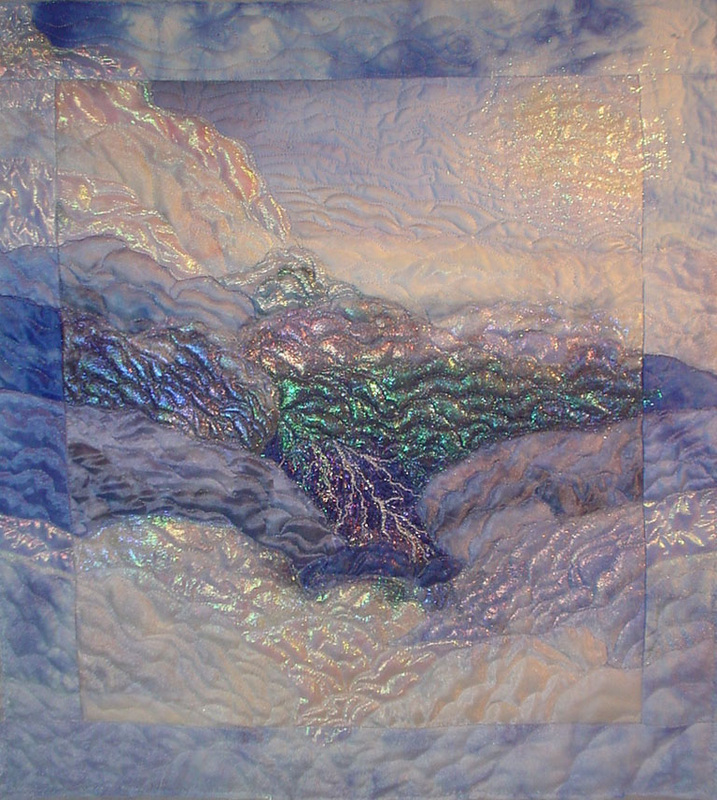 Larger wind quilt, 17" x 22"
Heavy silver metallic thread, preferably silver Glamour from Madeira, but Ricky Tim’s Razzle Dazzle will also work fine. Sheer fabrics – white tulle (you do not want net, you want tulle; tulle is very soft and fine and almost disappears against a background), opalescent organdie, white sparkle organza, sheer fabrics in opalescent, white, transparent, soft blues and/or blacks to make the clouds. Chiffon scarves are great for this, the kind you can get at the charity store for ten cents.